Sometimes serendipity comes your way. As I’m wrapping up my Houston book signing and school tour, I learned that today, Sunday, March 2, is Texas Independence Day. Go to this site to learn more of the battle and see the original documents and signatures: http://www.lsjunction.com/docs/tdoi.htm Since San Jacinto was so close, I decided to linger in the area this morning and visit the battleground and see monument that I have never seen (even though I’m a native Texan) other than in pictures. After I see the museum and grounds, I’ll be on my way back to Monroe. I had a wonderful time at Keefer Crossing Middle School in New Caney. Miss Jo Martin, who arranged the program, is a top notch librarian with an excellent facility and staff. I’ll post photos and more information on the school as soon as possible. Friday night, I was at the Woodlands Barnes & Noble. I had stayed with my friends, the Frantoms, who lived nearby. 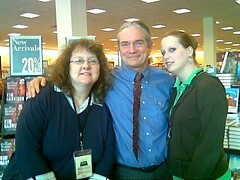 They said that six years ago they lived in “the country.” Below is a photo of me and and Libby, the Community Relations Manager of that store. 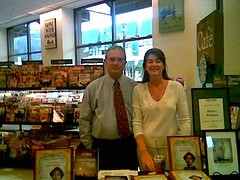 Saturday, I drove the other Barnes & Noble on Highway 6 in Houston for my second signing. Sales were brisk. I sold all the Jim Limber books and most of the Stories of the Confederate South. Here is a photo of Cherri, the CRM, and Kendra a staff member.